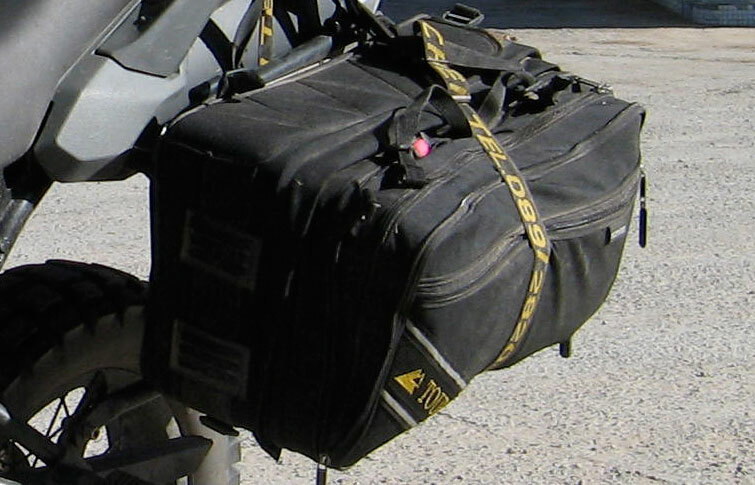 Small, fabric, quickly-detachable (q/d) soft panniers/cases which lock onto a thin alloy TT frame which then bolts on most racks. Includes a capacity-expanding zipped compartment, outside flat zip pocket, an elastic-topped under-pocket and a few mount rings. Converts into a back pack. 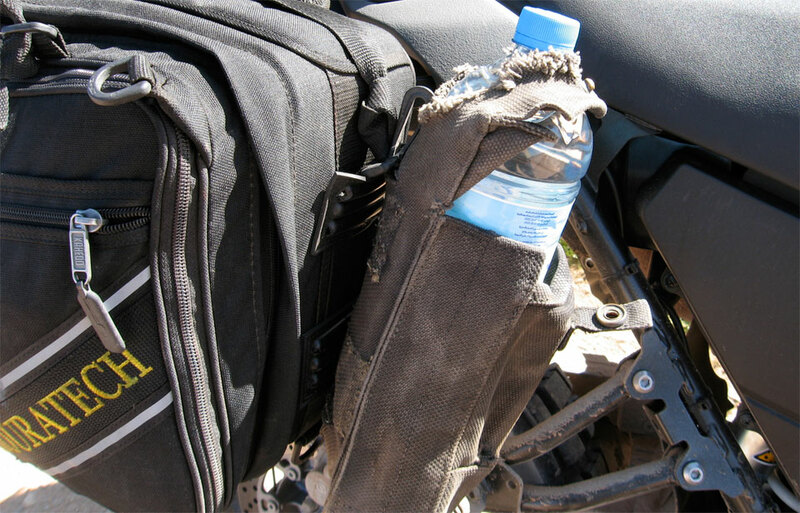 Off-road riding in Morocco in November 2008 on a Yamaha 660 Tenere. Expensive for what they are and only splash proof. A bit small, but sag in expanded mode. 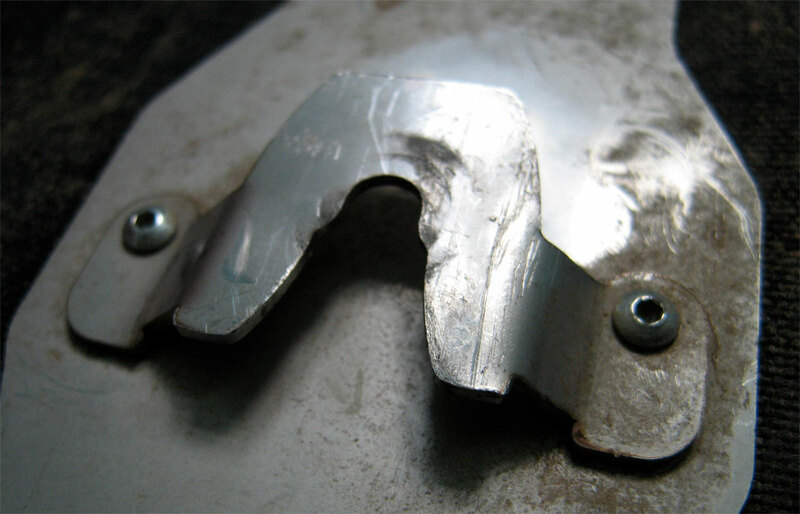 Flimsy alloy mounting frame on my version; others on the TT sites look notably tougher. 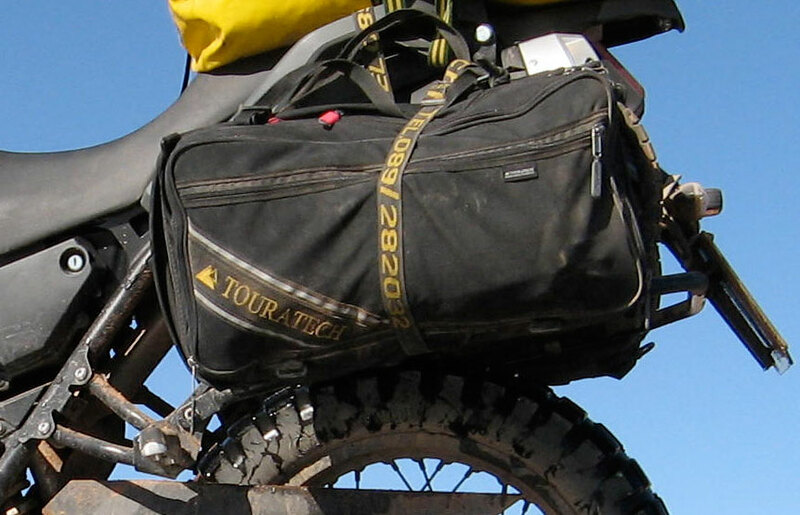 These bags were supplied free to me in exchange for a Touratech advert in my Morocco book. 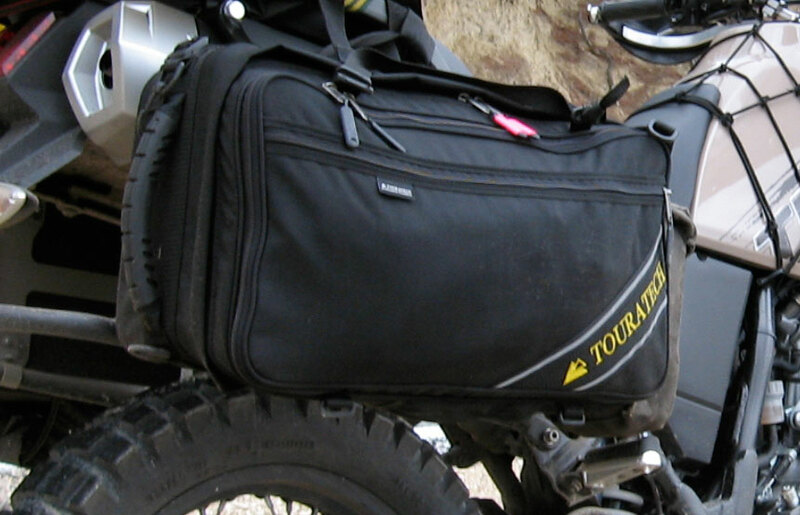 Touratech’s Zega Flex soft bags match the q/d element of some touring hard cases with the lightness of fabric. With a high-pipe bike like a Tenere, I believe soft luggage on a hard frame is the way to ensure a secure mount and avoid that melting feeling you get with throwovers like Ortliebs, Andy Strapz and all the rest. The q/d is neat and quick, handy for wheeling a bike into a hotel and a nice touch for a road tourer. Compared to alloy boxes, Zega Flexs are small: about 46cm long by 25cm high by 18cm deep (unexpanded) which works out a tad over 20 litres; the volume of a jerrican. Unzipped and expanded, the middle pocket adds another 8 litres or so. I’d have preferred something a bit longer and taller, but I suppose passenger legs and low pipe bikes become an issue; the slim width is good. They claim only 5kg max payload. The q/d mounting with ‘claws’ on the back of the pannier hooking onto four pegs on the thin alloy frame which you mount permanently to a proper rack, is pretty clever (you acquire the technique), but the claws sometimes jammed and needed to be kicked off (oiling would have helped for sure, as it did when the lock jammed with dust). 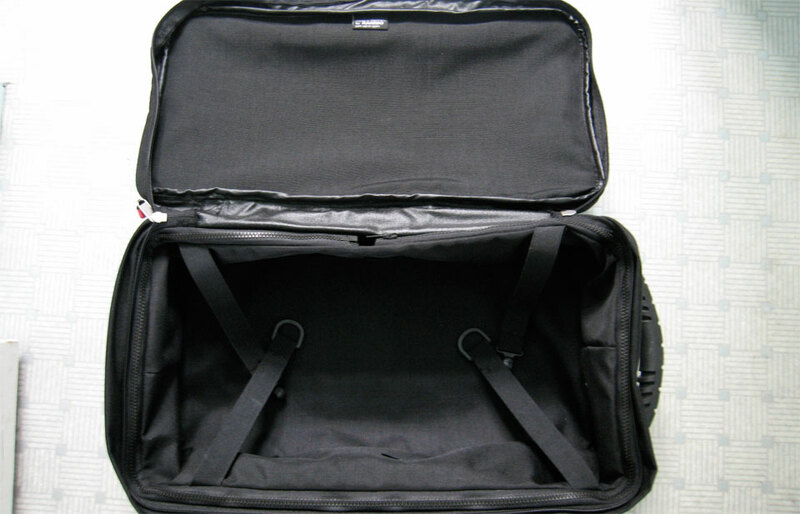 The ‘lock’ is more to stop the bags jumping off over a bump than an anti-theft measure. For the whole trip I supported the bags with extra straps through the main rack to save stress on the frame/claws and because I was typically running 10kg in each bag and didn’t think the mounts would have been up to it. One mount peg on the frame fell off, but I’m sure using the straps paid off. Without them the claws would have bent out on the dirt for sure. They don’t claim the bags to be waterproof and it didn’t rain enough on me to find out though I didn’t use the liners that TT offer. I liked the outer zip pocket for quick access and the expansion zip/pocket. I added my own exterior 1.5L bottle pocket but the whole backpack conversion idea (see the TT websites) is a bit of a gimmick IMHO. I cut off the backpack straps as soon as I got them and then made my own top handles from the straps left over (the chunky, molded back handle is not so usefully positioned and with new holdall handles it becomes redundant). There is a neat ‘underpocket’ which is good for stuffing in rags or wet gloves. Of course a hard crash with a long slide down the blacktop would do some damage and I do wonder how long the zips will last when they get dirty and you’re too tired to be careful. Overall I think they’re more designed for light road touring than sustained off-road use, but I’m glad I tried them. I sold the little-used Zega Flexes in early 2012 and got given some Enduristan Monsoon throwovers. 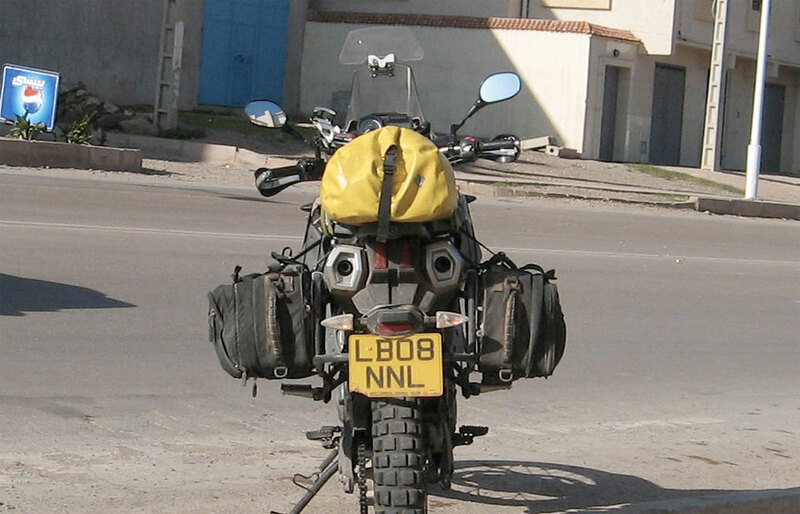 I was then thinking of making my own roll-top soft panniers to sit on an platform rack and then Adventure Spec Magadans came along. The HU thread I started some time ago is here. 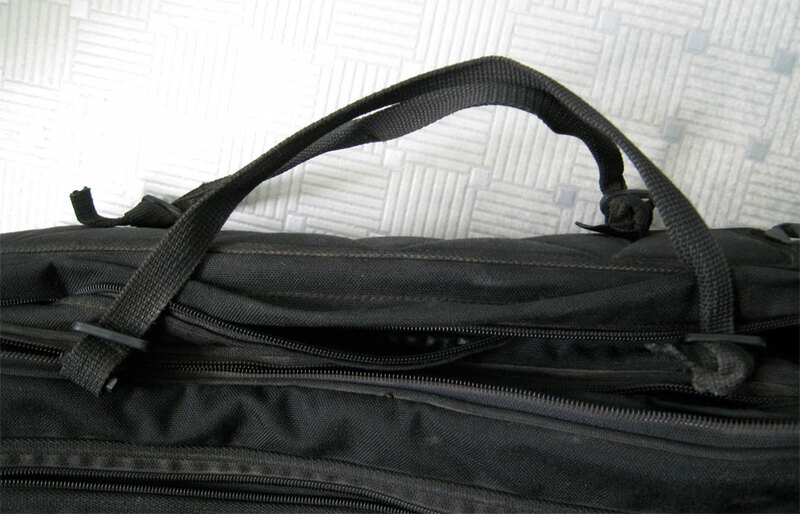 My bags mounted with backpack straps removed, but the relatively redundant rear handle (left) left on. 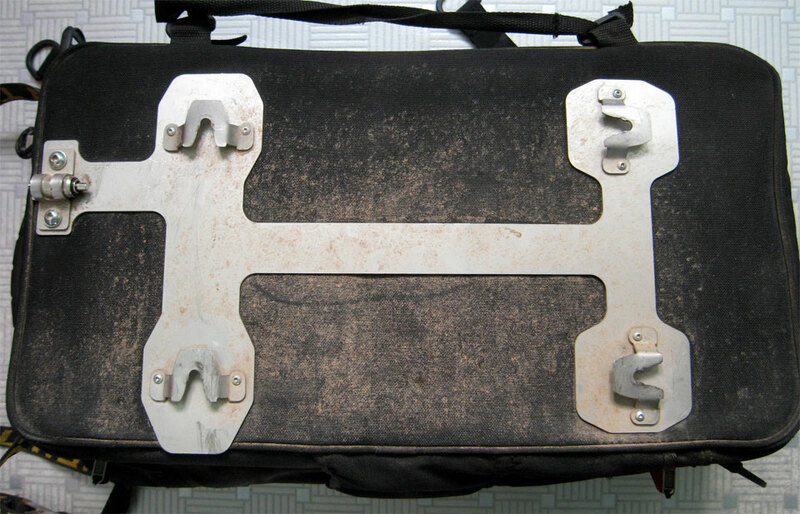 … to reveal the plastic ‘support’ box on which the ‘claw frame’ mounts. 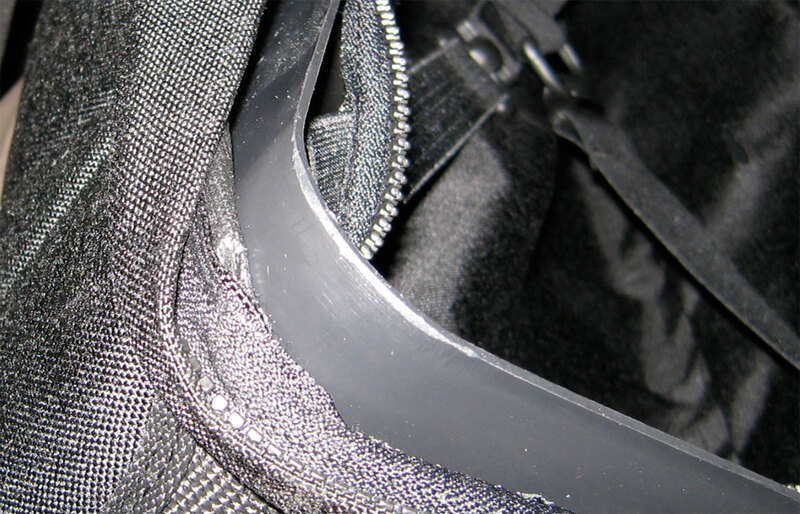 It also adds a measure of waterproofing from wheel spray and has a certain ‘hidden compartment’ utility. Zips, smooth but not too chunky. When they break or jam, it could all be over. 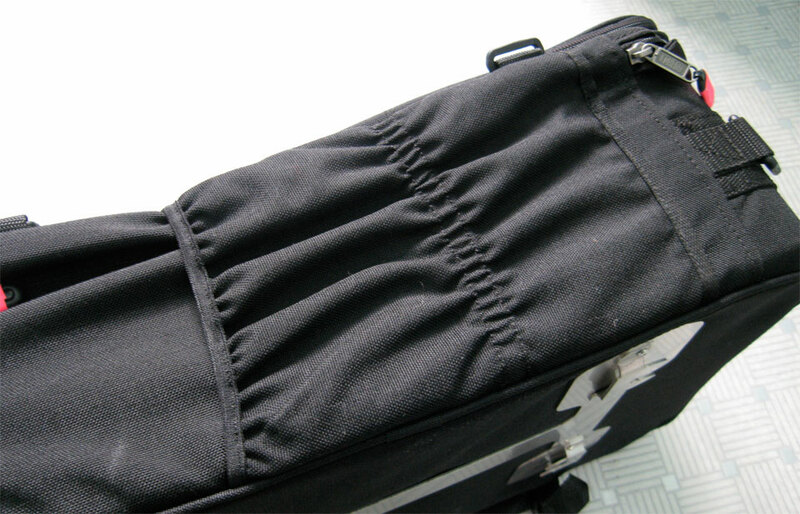 This is one advantage of a canoe bag-style roll top closure. I added pink tape to the main zip tabs to make them easier to distinguish from the expander pocket zips. 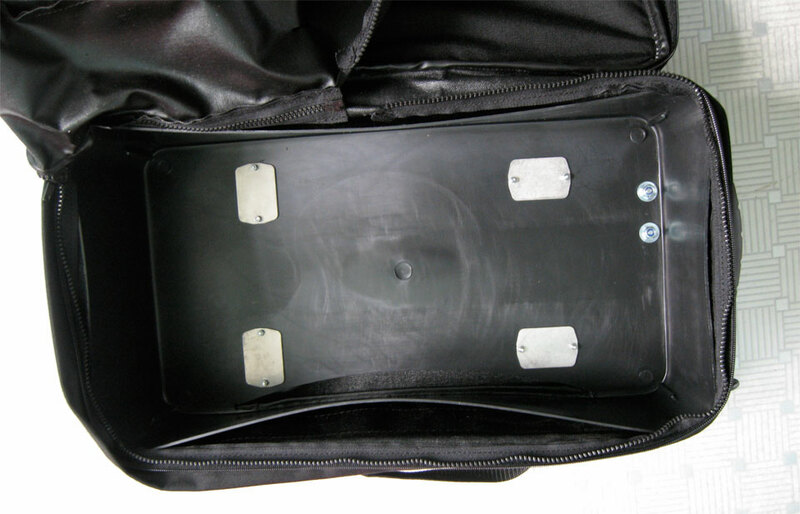 I saw some display Zegaflexs on a KTM 950 in the TT UK shop with a hole worn through the fabric by the top edge of the inner plastic box. To avoid this happening to mine I filed the corners down a bit. 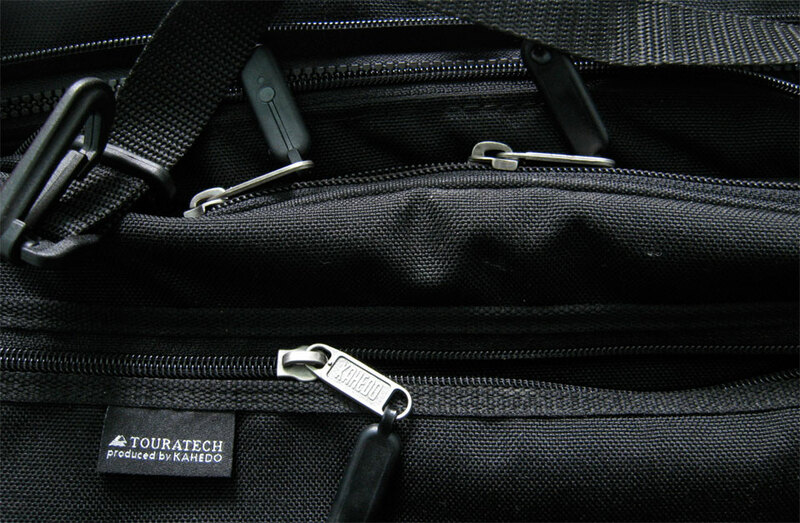 I cut off the relatively useless backpack straps and bodged on my own holdall handles. Much more useful and conventional. The alloy frame mounted OK onto my non-Touratech OTR rack. I needed one bracket from a hardware store to finish the job. The 4 mount pegs on which the claws hook are visible. One unscrewed itself and fell off. The back plate and claws on the wheel side of the bag. The claws showed some signs of wear and bending and sometimes jammed, even with the support straps which helped take the weight. All fittings are easily re-rivetable though. Underpocket: useful for stuffing stuff. I added my own exterior bottle bag. Mount rings here would have made this easier. 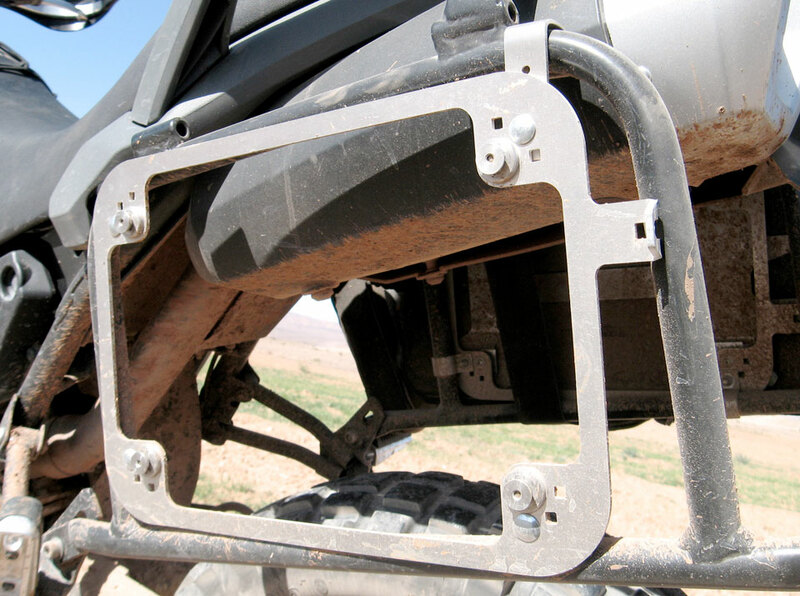 … I believe the support straps are even more important to spare the mounts, especially off road. 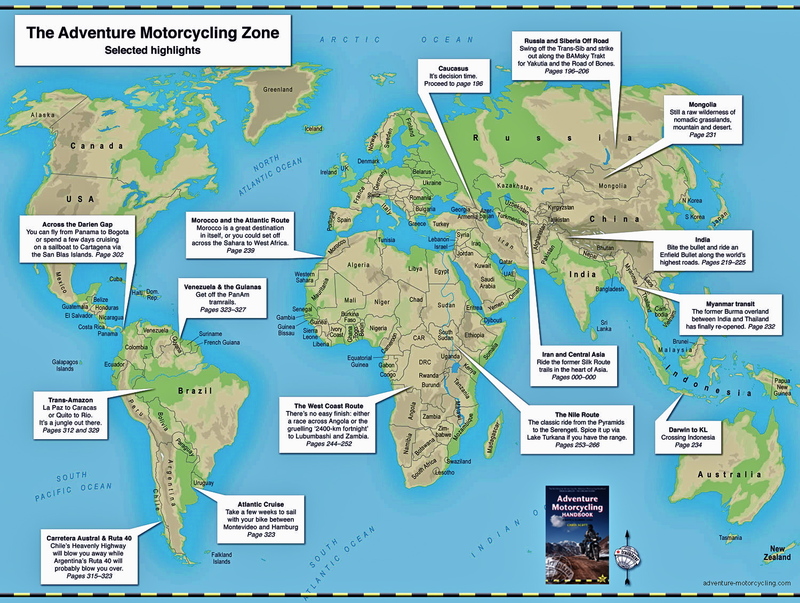 This entry was posted in Adventure Motorcycling Gear Reviews, Luggage and tagged Enduristan Monsoon panniers, Touratech Zega Flex, YAMAHA XT660Z. Bookmark the permalink.